Twin Loop wire provides one of the newest methods of binding for those requiring open-flat/lay-flat capabilities and security of bind, PLUS a high-tech image. The finished Twin Loop document uses flush-cut covers (the covers are the same size as the paper, usually 11"x 8-1/2") to present a neat, attractive and professional means of finishing written communications. The Twin Loop metal loops encircle the document completely and crimp together to hold securely. Even though wire binding has been used by trade binderies for years, there previously was no easy way to move this technique into the office. The equipment previously available was expensive and cumbersome. Colorcoil coil binding also provides open-flat / lay flat capabilities and security of bind, with it 's bright, trendy image. The plastic coils continuously spin through the punched document, adding zip to the appearance. 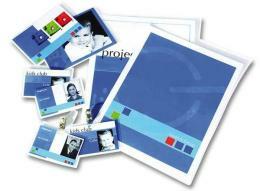 Color Coil documents use flush-cut covers to present a neat, attractive and professional finished document. Both wire and coil binding are recommended by many advertising agencies and graphic designers when the customer is looking for a unique binding style as well as a method that allows the document to open flat, lay flat and wrap around. An added benefit is that these two products hold up well when documents are sent through the mail. 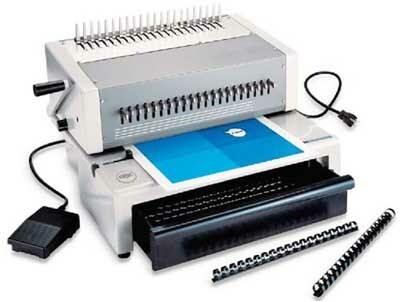 GBC was the innovator of desktop binding systems, starting with the introduction of Plastic Comb binding in 1947. Plastic Comb binding (trademarked by GBC as Cerlox and Sure-Lox) is a versatile and easy method of securing written communications, providing open-flat / lay-flat capabilities with the added benefit of the ability to frequently, easily edit the document. The plastic comb binding element can be opened and closed over and over again. The covers usually used for Plastic Comb binding are usually slightly oversized, 11-1/4"; x 8-3/4", to prevent dog-earing of the contents. In addition, comb binding spines can be customized by printing on the backbone of the binding elements. This type of customization allows for easy recognition of documents while on the reader 's shelf. This customization provides an economical form of advertising, making plastic comb bindings unique from all other elements available. 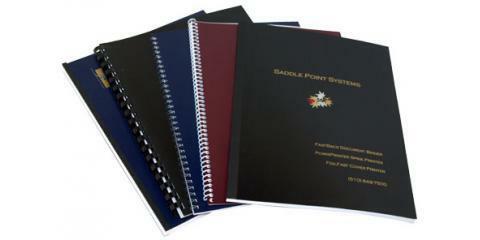 GBC 's Strip Binding systems, marketed under the names SureBind and Velobind, create documents of distinction. The tamper resistant hot knife process seals and rivets the binding comb and receiving strip together, increasing the security of confidential documents so no unauthorized additions or deletions can be made. Strip Binding is also bound with flush-cut covers for a professional-looking document. In addition to the image and security benefits of Strip Binding, only three different sized elements cover documents ranging from 2 to 750 sheets of 20# bond paper, reducing the amount of inventory needed, FYI, 750 sheets equates to 3 inches of paper! The Thermal Binding system creates impressive, professional, perfect-bound documents, with no visible, mechanical fasteners. Bind from 2 sheets to approximately 520 sheets of 20# bond paper in just seconds. The wrap-around Therm-A-Bind cover incorporates a pre-applied, heat-activated adhesive; which insures a secure, tamper-resistant bind every time. Because the cover totally wraps around the document, the backbone is ideal for customization / identification so the document is recognizable.